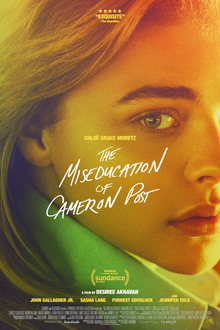 Focusing on a group of teenagers who are sent to a gay conversion therapy centre, ‘The Miseducation of Cameron Post’ is a terrific coming of age drama bolstered by a mesmerizing lead turn from Chloe Grace Moretz and a tactful approach to a challenging subject. The film is directed by Desiree Akhavan (known for 2014’s ‘Appropriate Behaviour’) and is based on a successful novel by Emily M. Danforth, and I thought it was a very powerful piece of work. Moretz stars as the titular Cameron Post, a gay teenager who is sent to a religious conversion centre after her boyfriend catches her and her friend in the back seat of a car on prom night. The centre is run by Dr. Marsh (Jennifer Ehle) and her brother Rick (John Gallagher Jr.), and it’s established early on that the centre is not a pleasant place to be with the teenagers undergoing ‘curing’ techniques under the watchful eyes of the strict leadership. Cameron takes solace in the company of two rebellious contemporaries, Jane Fonda (Sasha Lane) and Adam Red Eagle (Forrest Goodluck) as she tries to stay on the right side of Dr. Marsh without submitting to the cruel curing methods. The characters are richly drawn in such a short runtime and I liked how Gallagher Jr’s tragic figure of Rick is depicted, particularly in how the writers trust the audience to pick up on the subtle points they are trying to make. The film uses music and moments of levity to contrast against the dark setting, with a singalong sequence to ‘4 Non Blondes‘ working extremely well. The singalong sequence is a highlight of numerous films (‘Almost Famous’, ‘Girlhood’) and its use here reminded me of ‘The Perks of Being a Wallflower’, a film that I felt ‘The Miseducation of Cameron Post’ shares many themes with. Another cinematic touchpoint is ‘One Flew Over the Cuckoo’s Nest’ and the idea of cruelty being administered under the guise of helping, with Dr. Marsh a clear descendent of the Nurse Ratched school of treatment. Cameron has a great line about the inherent wrongness in programming people to be unhappy and to not be themselves and I felt it summed up the story this film was trying to tell superbly. ‘The Miseducation of Cameron Post’ is the year’s best coming of age film, driven by excellent performances and an approach to the material that gets the important points across whilst also celebrating youthfulness and finding pockets of humour amidst the darkness. I really, really liked it.